Complete e-Conveyancing is available from within LEAP Conveyancer, including: conveyancing matter types, VOI, certificates and searches, contract, e-Signing, exchange and electronic settlement. You can trust LEAP to securely store and back up your data. It's stored on AWS servers in Australia, monitored 24/7 and uses military-grade encryption. This is the same data security as the major banks. Settlement adjustment sheets automatically calculate your adjustments from matter information entered. Should the settlement date change the calculators will update your adjustments, including council and water rates for you. "As a growing small boutique conveyancing firm, we appreciate that LEAP is like part of the family in that it managed to incorporate all of our conveyancing needs in one shop." "After starting my own firm I decided to use LEAP Conveyancer software. As one of the few in WA that use it I have found it to be amazing and helps my business to become super-efficient." 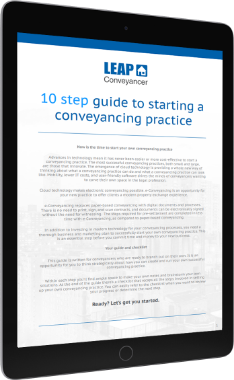 "LEAP Conveyancer has been a terrific tool for my business."